Toybank Pune kick-started 2011 with a great bunch of toys collected at Linger On Cafe at Baner Road. Radhika and Rajesh from Linger On helped us organize the drive at their cafe. They also helped us reach out to the neighbourhood societies, IT companies and schools to spread the word about Toybank. The Collection drive was conducted between 3rd - 9th April followed by a Wrapping event on 9th April. 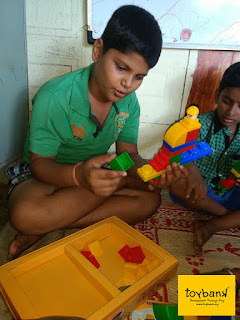 Toybankers Amritlal, Mohnish, Jigyasa, Rucheela and Avni gathered at Linger On on 9th April around 10:00 am and spent about two hours learning about Toybank and wrapping the toys. About 95 toys were collected and wrapped! The collected toys were then transferred to the Kaymo Storage Space at Old Pune mumbai Highway with support from Rajashree. Toybank thanks all the schools, IT companies and societies who supported and helped make the drive at Linger On a success. Toybank also thanks Linger On for all their efforts in organizing the Drive and bringing smiles to more children in and around Pune. Toybank thanks its volunteers for spending sme time and neatly wrapping the toys for children. I am thankful to all for having me a part of this I really felt nice for the children receiving this cause the kind of gifts we got for wrapping was amazing. 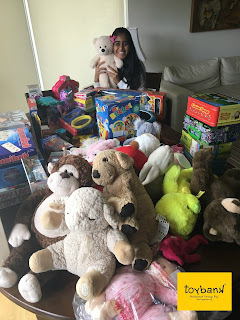 I was stunned with the variety and quality of the toys, it really made me feel by giving this off to someone in need would really mean a lot to the child and would get one sparkling smile on the kids face . I appreciate the collection efforts hope to be a part of this for a long period. God bless the kids. Toy wrapping event was great fun ! Although it was my first time wrapping a bunch of toys all at one time, I enjoyed it and the feeling that the kids would love having the wrapped up gifts was satisfying. Looking forward to the toy distribution event and many more wrapping sessions. Volunteer of the month for March 2011! A GOOD Friday at Salaam Baalak Trust!